The owner of a spoof Twitter account is to keep his or her identity hidden after Northcliffe Media and Twitter both backed down. 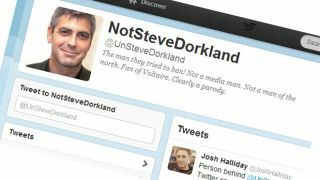 Twitter had told the UnSteveDorkland account, which parodies a Northcliffe Media executive named Steve Auckland, that it was going to hand their personal details over to the company as a result of a court order. But when the tweeter launched a legal rebuttal, the social network changed course and said it would keep schtum until legal action was resolved. That day came pretty quickly, as Northcliffe Media has now decided not to pursue UnSteveDorkland through the courts any further. The still-anonymous tweeter reckons this is a victory for common sense as well as free speech, badass lawyers and the internet at large. He or she said, "By withdrawing the case against me they have, finally, recognised the futility of their heavy-handed approach and the entirely baseless nature of all the accusations they threw at me in a vainglorious attempt to divert attention from the real issue, namely their idea that by throwing money and bullying tactics at someone you can throttle freedom of speech. "They underestimated me, they underestimated my lawyer Frank Sommers and they underestimated the power of the worldwide internet community." Northcliffe Media released a statement that maintained the joke account amounted to "cyber-bullying and harassment" but that a lengthy court case "would require direct involvement of the very staff we are anxious to protect". Its statement added, "His or her intention may initially have been humorous, but these tweets went far beyond commentary and satire, causing pain and offence. "We encourage humour in our business, but no workplace should be expected to tolerate an unrelenting flow of derogatory and degrading comments of questionable legality."